Weedoo Oil Skimmer Belt Option for AquaHarvester™ model workboat. Ideal for chemical clean-up in shallow waters and along shorelines. The A-1464 kit includes oil/chemical skimming belt designed to skim oil/chemicals and separate from water. 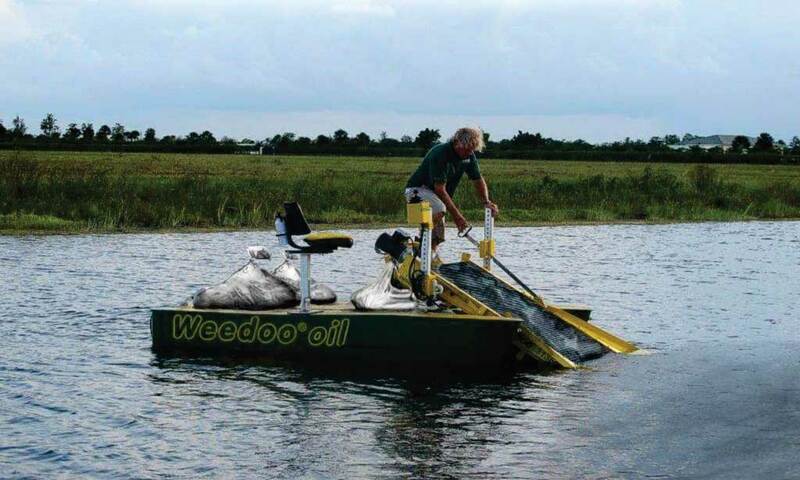 Weedoo battery powered 170-OIL belt extractor/bagger system is for hi-speed recovery of sheen and thixotropic oil from waterways. This kit converts any Weedoo 300 series workboat equipped w/Weedoo 170-EBH universal harvester into a oil/chemical marine skimmer. The kit includes a squeegee assembly that removes the oil/chemical from the belt and deposits directly into the Weedoo patented containment bagging system. Weight 110 lbs. Interchangable with AquaHarvester’s 170 On Board Conveyor (Extractor/Bagger/Harvester).